The A.V. Club is always on the lookout for new and terrible alcohol to drink, as well as for new and non-terrible people to drink it with. 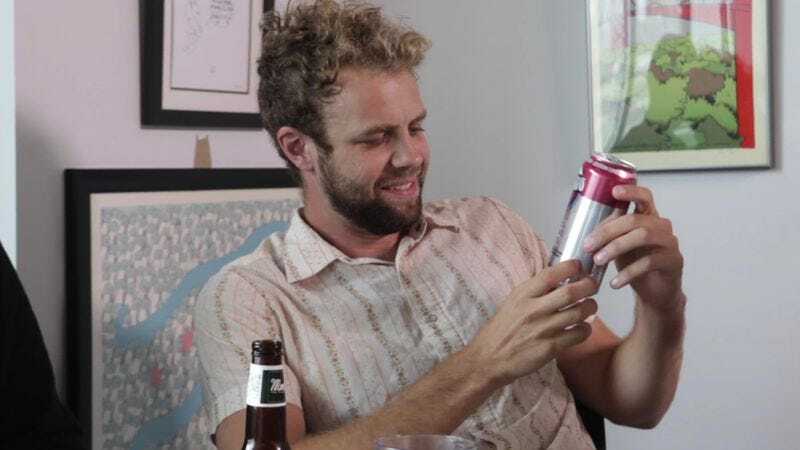 That’s how we ended up drinking something we saw described as “the worst thing I’ve ever ingested” with Brooks Wheelan. The comedian and actor was in town for Chicago’s inaugural Comedy Exposition and stopped by the office one Friday, just before he was sadly and unceremoniously dismissed from Saturday Night Live. In the video below, he helps Senior Editor Sean O’Neal and Digital Manager David Anthony plow through not only a single bottle of MmmHops, Hanson’s punny beer (yes, that Hanson), but also three disgustingly large cans of Mott’s Clamato Caesar Bacon Vodka drink generously mailed to us by Canadian reader Michael Barenberg. Although Wheelan didn’t necessarily think the Clamato was as “piercing and relentless” as food blog The Impulsive Buy did, The A.V. Club’s staff drinkers weren’t quite so generous.